Renewed international attention to the situation in the Central African Republic (CAR) and the change of leadership in the violence-torn country bring new hopes of putting an end to the CAR’s spiraling sectarian violence that wracked the country during the disastrous ten-month tenure of former interim president Michel Djotodia. The election of Catherine Samba-Panza, the country’s first female president, who was sworn in on January 23 to lead the second transition after the military coup that toppled former president François Bozizé in March 2013, constitutes a singular and historic choice for the central African nation. For the Central Africans, the election of a woman to the highest office in the land permits fresh hopes for a better future, notwithstanding the country’s unprintable woes. However, despite widespread declarations of support by her fellow CAR nationals, regional actors, and the international community, the newly-elected interim president faces an insurmountable task, should these well-wishers not follow through with concrete actions. Given the potential of central African women to be actors for peace, and the new president’s commitment to gender parity, every effort should be made to ensure that these women are enabled to actively participate in the next elections as informed voters and motivated candidates. Disarmament of the various armed groups is a priority for the new president. However, for this effort to be sustainable, it must be accompanied by a credible job creation program and vocational training activities, targeting in particular the radicalized youth among these groups. Addressing the dire security, human rights, and humanitarian situation is urgent. Equally urgent is the rebuilding of key state institutions and the restoration of basic social services to the population. Unless concerted regional and international efforts, combined with a clear, unified and effective engagement by all national actors, quickly materialize in support of the new and acclaimed female leader, these challenges will remain insurmountable. These sentiments are not alien to a country where women have often constituted the ultimate bulwark against the murderous follies of the men who have presided over the destiny of the country since independence. In traditional CAR, whether at the village council level or at the national level, women unhesitatingly questioned decisions made by men whenever they felt that these decisions were unjust or threatened the wellbeing of children and social harmony. Regardless of their ethnic affiliations, women as bearers of life and educators are seen as peaceful beings that never carry weapons. In certain situations, when words proved ineffective to stop the fighting, elderly women would threaten their nakedness or go down on their knees, signifying “a curse for those who bore the responsibility for such grave acts.” During the 1996-97 mutinies in Bangui, unarmed women from all religious and ethnic groups braved shells in order to meet the fighters and negotiate peace. Their contributions proved invaluable to external third-party mediators who had been sent by regional leaders to help belligerents move from violence to politics. It comes therefore as no surprise that many Central Africans are pinning so much hope on the election of Sampa-Panza as their first woman president. The election of Central African Republic’s first female president by the national transitional Parliament, less than two weeks after the forced resignation of ex-Seleka rebel alliance leader and self-appointed president Michel Djotodia, gives a new momentum to the efforts to address the ongoing violent crisis in the central African country. A corporate lawyer and businesswoman, born in Chad to a Cameroonian father and a mother from CAR, trained in France, and appointed mayor of Bangui in May last year, President Catherine Samba-Panza was seen as a candidate of consensus. She seems to embody new hopes to lead her country out of the violent crisis that, in less than a year, saw over 2,000 people killed, 1 million people driven out of their homes, and half of the country’s population in need of humanitarian assistance. The presence of UN-mandated African troops backed by French forces since December has so far done little to stop the persistent sectarian killings and the indiscriminate human rights abuses, including the recruitment of up to 6,000 children by various armed forces and groups, according to recent United Nations estimates. In a country where Christian and Muslim communities have lived together peacefully for decades, expectations are high that the new interim president will bring an end to this endemic insecurity, and pave the way for reconciliation. Upon her election, President Samba-Panza called on both Muslim and Christian militias, the ex-Seleka and the self-defending anti-balakas—who are now reported to include former soldiers sympathetic to former president Bozizé—to put down their weapons. A former vice-chair of the national reconciliation conference in 2003, President Samba-Panza also announced her intention to meet with the various armed groups, listen to their grievances, and determine how best to address them, if they prove reasonable, within the limits of the resources at her disposal. It is understood that disarming the young among these groups will not be sustainable without a significant influx of jobs and targeted vocational training. Beyond the restoration of peace and security, and the promotion of reconciliation, another challenge the newly elected president will need to overcome is to rebuild the collapsed institutions and restore public services. The disintegration of defense and security forces following the March 2013 military coup, the destruction of schools, health centers, courthouses, and prisons, as well as months of unpaid salaries to civil servants have further weakened the already dented authority, legitimacy, and credibility of the state throughout the country. A minimum rehabilitation of these state functions should be achieved before the new interim president can hope to tackle her third major priority: the preparation of elections within a year. Addressing the underlying factors of the crisis in the CAR, including long-standing governance, development, and human rights deficits, will require the democratic election of an inclusive and accountable government that can serve as a credible and responsive interlocutor to all its national constituents as well as regional and international partners. 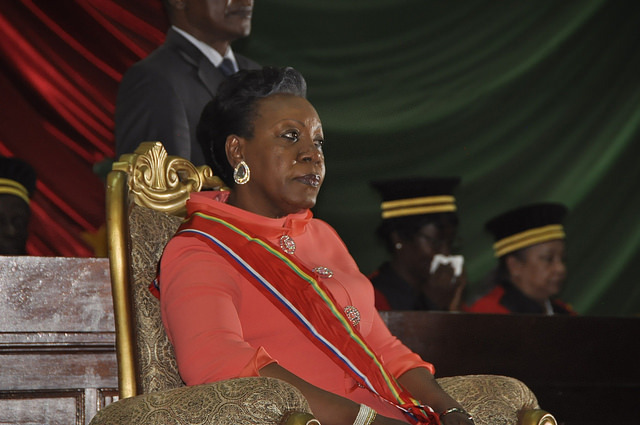 In preparation for next year’s elections, President Samba-Panza will have to balance the need for a swift return to constitutional order requested by CAR international partners, with the necessity of a thoroughly planned and carefully implemented electoral process that lays the foundations for a less reversible peace—a tall order, given the precarious situation she inherited. The new president, with all the esteem she seems to have garnered as a courageous and charismatic leader, cannot overcome these formidable challenges without the strong backing of her regional counterparts and the international community at large. Despite ambiguities of its past involvement in the CAR, Chad—the current chair of the Economic Community of Central African States (ECCAS) and also on the United Nations Security Council for the next two years—will have to play a constructive political and military role in support of the new interim president. This will be measured by greater efforts of Chad’s contingent in the African Union-led International Support Mission to CAR (MISCA) to protect civilian populations regardless of their ethnic or religious affiliations, wherever the troops are deployed. With the deployment of additional troops from Rwanda, MISCA currently stands at 5,000 troops, 1,000 short of its authorized 6,000 troops. The African force is supported in the implementation of its mandate by 1,600 French forces. On January 20, the day President Samba-Panza was elected, the European Union, at a meeting in Brussels, authorized a military mission of about 500 European troops to back the African and French forces in CAR. These numbers may prove insufficient to restore security and order across a territory roughly the size of France. At a donor meeting also held in Brussels on the same day, EU member states and other international donors, including the US, the World Bank, and the African Development Bank, pledged nearly 500 million dollars to help CAR address the dire humanitarian situation. There is hope that such concerted efforts, combined with a clear, unified, and effective engagement by all national actors, will help the new president bring a modicum of peace back to this fragile and conflict-affected central African country.